The Chairman and CEO of Emirates, Ahmed bin Saeed Al Maktoum, will attend the upcoming Sarajevo Business Forum, the largest investment conference in Southeast Europe, organised annually in the Bosnian capital. The conference, which begins next Monday, will see Al Maktoum take part for the first time since 2010. His previous visit proved instrumental in the launch of Flydubai's services from Dubai to Belgrade, Skopje, Sarajevo and Zagreb. The Sarajevo Business Forum links up institutional and private investors from all over the world with businessmen and project developers from Bosnia and Herzegovina, Albania, Croatia, Macedonia, Montenegro, Serbia and Slovenia. It represents a platform for business networking and the exploration of investment opportunities in Southeast Europe. Double daily A380 to SJJ confirmed! Thumbs up! That's the good one! ;-) You made my day mate, cheers! EK L410 4x daily reconfirmed !!! perhaps in 20 years, sure, as is no chance of Emirates serving Zagreb and Sarajevo. Zagreb in fact is their smallest airport they are serving, in Europe that is. Emirates never flies to a an airport that has less than 5 million pax and never to an airport where they are flying with FlyDubai or where Etihad is present, unless airport has over 20 million pax per year. Flying to Sarajevo won't happen any time soon. In fact Emirates won't be flying anywhere in the region, Zagreb is it. S obzirom da je sve i jedan Fly Dubai avion pun u dolasku i odlasku, nije nerealno niti sekunde. I'm sure you have all the data at your finger. And you can support all your claims. I thought so. In the age of internet claims of snake oil cure, are so last century. No chance of that, find me European or world destination where Etihad and Emirates serve same airport, that has less than 20 million pax. Good luck with finding it. Emirates won't be coming to Belgrade before 2050. Google for word spamming, before you use it next time. As to flying before 2050, sure, Etihad might go broke and being taken over by Emirates. As is, Belgrade will need to reach 20 million pax before Emirates shows up. This is how Emirates and Etihand operate. 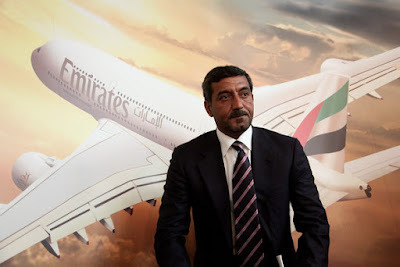 Only way for Zagreb to get Emirates flight is to subvent them financialy. And when it comes to subverting anyone, especially financially, If I were you I'd keep that bit to myself. Europe guys and look at all airports in question where Etihad and Emirates fly to at the same time, all of them over 20 million pax, all of them !!! No flights to Belgrade any time soon, at current rate, not before 2060. Only if Etihad goes broke will Emirates show up. Look at all airports you mentioned and look at number of passengers. Come back to me after that. As to Venice airport, which handles 10 million pax, this is exception, Etihad flies to Venice seasonally, and Venice is one of the most popular travel destinations on the planet, and place for the rich and ultra rich. Milan, Rome and Florence also fall in this category. However Florence has very small airport and it is served by Pisa airport, combined the two airport handle 8 million pax. You simply can't compare Venice with Belgrade, it has far greater statue when it comes to international travel for the super rich. A small apartment 40-50sqm in Venice cost around $400 000. Venice has more luxury hotels per square kilometer than any other city in the world. ZAG is much smaller than any other airport EK serves in Europe. Venice has far more tourists than Zagreb. The ONLY way to explain EK coming to ZAG is significant subsidy to support the route. Sure, Etihad is getting massive subsidies and as do all other airlines that fly to Belgrade. This is only way of explaining why few legacy carriers that do venture to Serbia. Using same analogy and logic you just used. Croatia is visited by 170 000 Australians, 30 000 New Zealanders, over 1.7 million non-European visitors visited Croatia in 2016. Zagreb gets more foreign visitors than entire Serbia, perhaps that should have been the clue. No subsidies for anyone. Emirates is coming cause they're seeing financial logic in what they're doing. However, you're free to continue to troll on, this won't change the fact Zagreb has Emirates. BTW there's nothing stopping Belgrade paying subsidies to get Emirates. I am sure if Belgrade paid $1 million per week Emirates would show up. This is if Belgrade can afford to splash out $52 million each year on a single carrier. You logic is really worrying. Take a break man. It's ok. Emirates will fly nowhere other than Zagreb. Hope you feel better now. EK is faced with increased competition, laptop ban to the US, profits are tumbling down and plane orders are being postponed. They could use a healthy subsidy for low demand and low yield destinations. I won't defend Emirates, in fact I see laptop ban as a form of market protectionism. They know ME can't introduce laptop ban as they depend on transfer passengers, it is their core business. However, very likely reaction by ME carriers will be to cancel their Boeing orders as a measure, and transfer their orders to Airbus and Or Bombardier and CS300. The halt in order on Boeing plane is a first shot by ME carriers, however if laptop ban continues, ME will cancel their Boeing orders and transfer their orders to Airbus. Ultimately the biggest looser will be US planner manufacturers. Europe would not impose laptop ban, cause they know if someone is going to blow things up in the air, cause it is futile, after laptops, ban on mobiles, after that ban on luggage and after that no passengers. Silly racist yanks and brits can't see beyond their nose. Arrogant bunch.